Things are coming together for all you Loyal Legionnaires. This past week I have been pounding the pavement, or rather the great research tool - the internet, getting together images for reference, costumes, vehicles, buildings and all things needed for the first issue of Captain Spectre. As prep work, as you all know, I need to get comfortable with all the characters in the book. No matter how little they have to do with the story. Mainly because visually I want this book to be the best thing I have ever done. 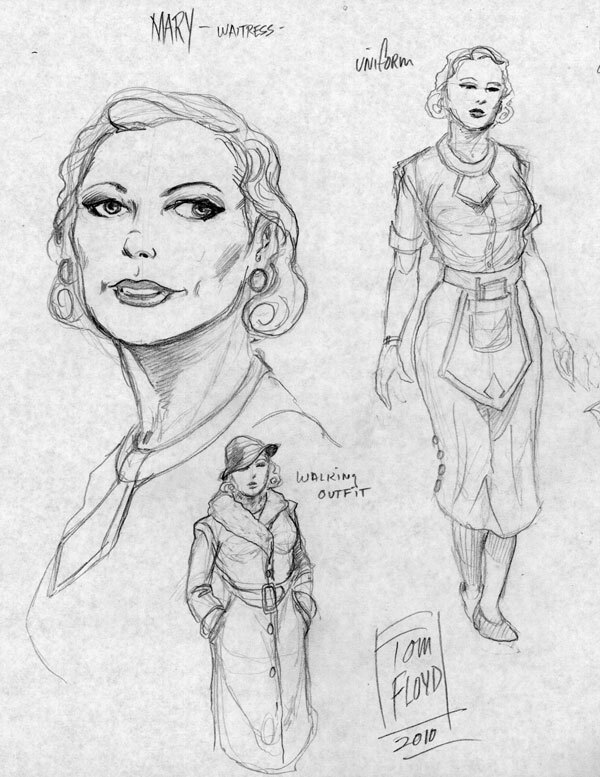 So I went back to the 'Mary' the waitress character to do a bit better design work than before. Also found a better truck that I needed. This two and half ton ford cab-over from 1939 is a better fit for what I wanted. So as I mentioned the process begins. 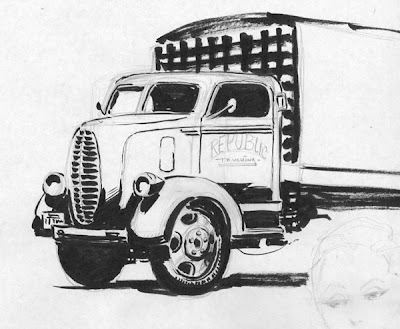 How do I draw these vehicles, what kind of inking do I want on them. 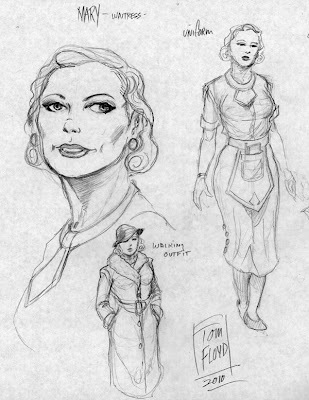 What style or degree of contrast in the inking. So I did a rough with a new pen brush I bought. 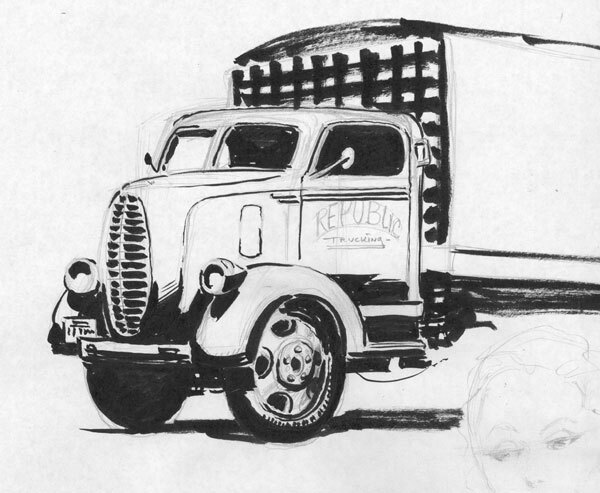 Served two purposes, tested the brush, and gave me some vehicle inking practice for the book. 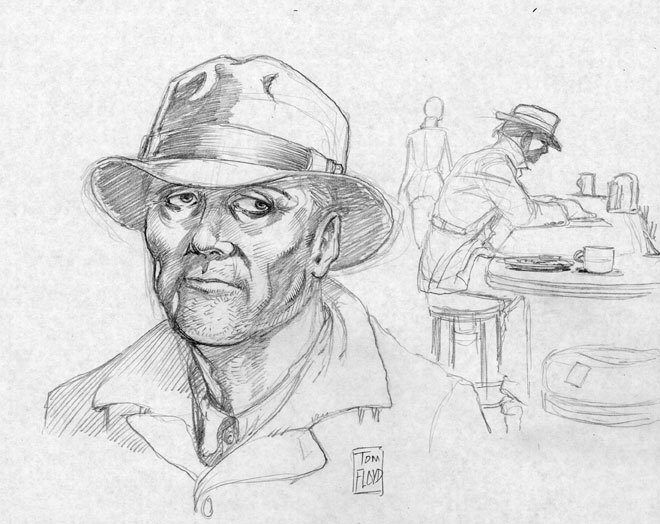 It seems more and more I try to make things, drawings, sketches, and the like to do double duty - as time is always a factor. So my plans for New Years are to continue with this process, as this morning the ice is coming down already. The sidewalk is slick.....the dog was even sliding around as he went out for his morning bathroom adventure, I have food in the icebox, the power hasn't gone off, and I have no plans.....other than working on the book today. It is going to be a very good day I think. So Happy New Year to all you Loyal Legionnaires! Stay safe, don't drink and drive, try not to drink too much......and get rid of this year and let's make this new year a much better one!! And again thanks for tuning in...... oh and also, I finally have my main villain for issue one. I am trying to figure out if I should post it, or keep it a deep dark science secret. I hope everyone is having a very merry Christmas!!! Well...Somebody had to do it!! 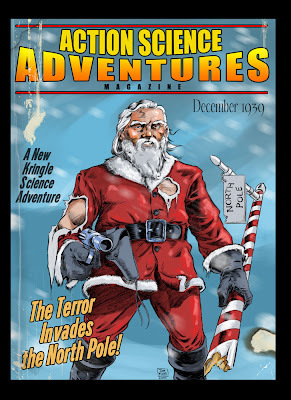 Merry Christmas Loyal Legionnaires, and readers of Action Science Adventures Magazine! This very well could have hit the local news stand in December of 1939! Who's to say it couldn't have been done. Ha. I was thinking about doing something for Christmas again this year, and just couldn't come up with anything. I sure am not feeling the Christmas spirit...I usually don't.... the holiday is totally wasted on me. The only thing I like it for is the time off, and I won't even get much of that this year. I have a deadline at work and it is taking me more time on the project than I guessed. Just one of those things that happens way too often. Then this thing sprang full blown into my mind late last night. 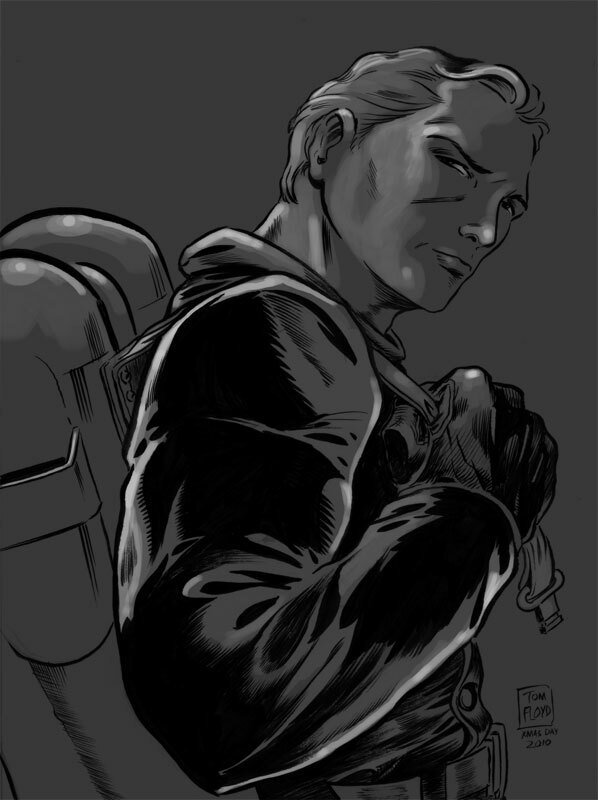 I hadn't actually inked anything in a bit...the job I am doing for work is being inked 'digitally'. And I am not a fan of working that way, but the job calls for it. Anyway, I wanted to kill two birds with one stone....so I did a Christmas thing and inked it....then threw some digital coloring at it, and here you go Loyal Legionnaires! I would assume that Captain Spectre would give up his feature story once a year for a new Kringle: the Avenger - Super Science story. I can only imagine aliens landing at the north pole to steal all the toys. This of course would result in a world wide disaster that only Kringle: the Avenger could deal with....maybe with a bit of help from Captain Spectre! ha. Enjoy Loyal Legionnaires......Merry Christmas and happy holidays!!!!! I apologize for the lack of updates lately.....sorry. Sorry for the lack of updates. Things are just nuts right now. With so many things going on. Then the holiday season is always a trying time for me. How to spread what little money I have between my two sons and their families. It is more of a depression with me. Hell, my two sons are way better heads of families than I ever was. They are more successful with it all. I am very proud of them. Of course I consider myself the prime example of what NOT to be or do. Also with the cold weather the arthritis is worse. I am going to move up the food chain of doctors, mine is sending me off to a specialist.....oh boy is that probably going to turn out bad. Well I guess my doctor is right, I shouldn't rely on just pain meds for it all. I just don't think they understand tho.....I will not let them cut on my hand....hell, took 57 years just to draw as bad as I do.....I don't want to relearn it all over again. Anyway enough of my depression......above is the cover for the HIV comic I am working on. This thing has a tight deadline and is keeping my very busy. 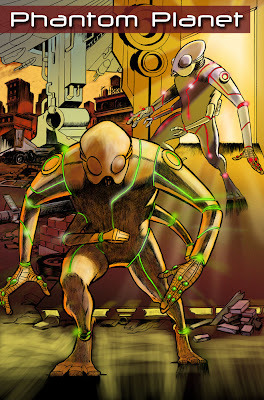 I am finding a bit of time to continue work on the KiGor short story. 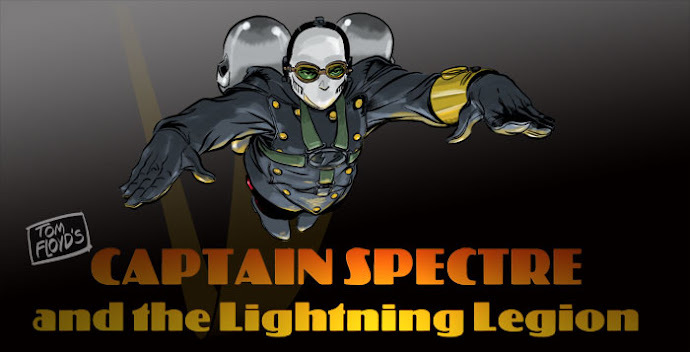 And of course time to work on the story for the Captain Spectre first issue. I really want the first issue of Captain Spectre to make a hit. So I am working extra hard on the story. I hope everyone will be happy with it. Again sorry for the lack of updates, I will try harder to keep everyone in the loop. Thanks for tuning in all you Loyal Legionnaires!